Virtual and augmented reality are poised to radically transform learning and training as we know it. We think so. Others agree. And the research backs us up. But what’s more, according to a new report from interactive entertainment market intelligence firm SuperData Research, businesses who embrace technologies like AR, MR, and VR for training are predicted to save an estimated $13.5 billion dollars in training costs throughout 2019, compared to organizations who continue to rely on traditional, non-immersive training solutions. According to their research, 71% of companies that have already embraced virtual reality—Walmart, Tyson Foods, and American Airlines, to name a few—are primarily using the medium for training purposes. In turn, much of the $13.5 billion in savings stem from the reduction or elimination of costs associated with traditional training practices including hiring instructors, reserving dedicated training spaces, and travelling to said locations. 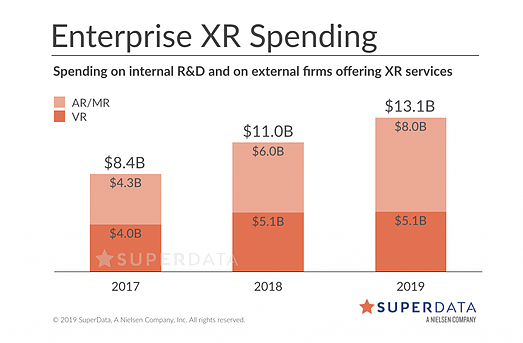 As the cost of XR hardware steadily declines while spending on corporate training grows among U.S. companies, it’s natural that more organizations are choosing to invest in XR training exercises each year. And for good reason—immersive AR, VR, and MR simulations are a powerful cost-effective method of helping trainees practice key job functions, often in scenarios that are difficult to train in, but must be worked in. I’d recommend checking out our roundup of examples of VR in industrial training for a closer look at various ways XR facilitates the practice of dangerous tasks in controlled, safe, and simulated environments. 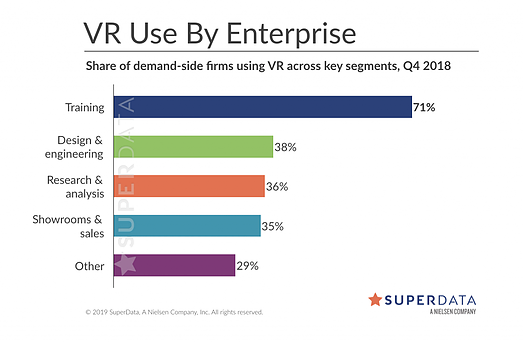 SuperData predicts that businesses will represent the largest slice of demand for AR and MR hardware in 2019, accounting for approximately 85% of AR and MR headsets sold throughout the year. Today, there exist more custom XR developers and off-the-shelf immersive training products than ever available before, making now the perfect time for instructional designers and training experts to consider investing in XR training solutions for their organizations. Interested in exploring the various ways you can incorporate XR in your organization’s education and training programs? Get in touch with our team of expert game and simulation developers – we’d love to hear your ideas, and share a few of our own!